This inspired (and inspiring) two-part set weaves an examination of the nature of scientific inquiry into a compelling study of evolution. The package consists of a teacher guide on CD-ROM with a text designed specifically for high school students. 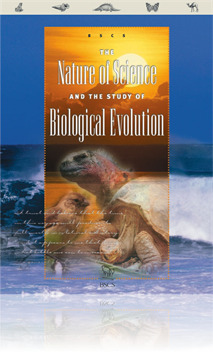 The text’s stage-setting first chapter provides a broad introduction to the nature and methods of science. The remaining five chapters cover the events that led to Charles Darwin to develop his ideas on the unity and diversity of life on Earth; seven lines of evidence that support the theory of evolution; population genetics; natural selection; and primate and human evolution. To help students monitor their own learning, the book’s special features include statements of key concepts, strategies to reinforce learning, and memorable quotes about evolution. The teacher CD ties in with major points in each chapter, where activity icons serve as invitations to explore major concepts in more depth through the CD’s related activities and Zoom Ins. This is a great little text that provides a comprehensive guide for an introductory study of biological evolution and the evidence supporting it.